HISTORY: AERONAVES DE MEXICO S.A. was established on 15 September 1934, by Antonio Diaz Lombardo. Its first aircraft was a Stinson SR. Julio Zinser piloted the maiden flight on the Mexico City - Acapulco route on 14 September 1934. 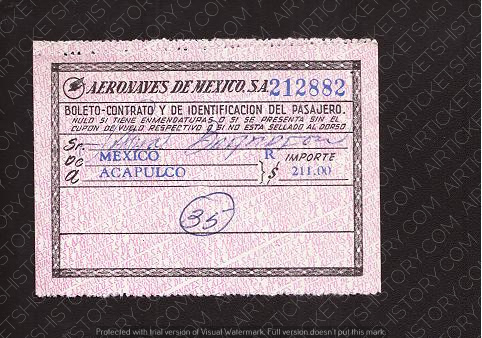 Between 1962 and 1963, Aeronaves de Mexico (Aeromexico) took over Aerovias Guest Mexico the second airline, and they were merged under the name Aeronaves de Mexico. A new color scheme (orange and black) was introduced and the airline changed its name from "Aeronaves de Mexico" to its current, shortened version of Aeromexico in February 1972.